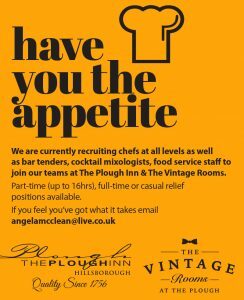 We are now recruiting part time food & beverage staff. There are two positions available for weekend work, approximately 12-18 hours per week with the opportunity for extra shifts during holiday periods. The ideal candidate will have previous experience in a customer facing role, be friendly, outgoing and capable of working as part of a large team. Duties will involve working in our busy bar & bistro, taking orders, serving food and drinks, making coffee, cash handling and occasionally working in our nightclub The Reflex. A uniform is provided and full training will be given. Please note applicants must be over 18 as you will be required to sell alcohol.